The notation symbols that we have learned in this tutorial are good for describing how all of the notes in a piece of music fit together, so that it can be reproduced accurately. However, we still have no way of indicating how fast the piece of music as a whole should be played. For this, we need the concept of musical tempo (which is the Italian word for 'time'). Tempo is usually measured in quarter-notes per minute (or qpm), and indicated in staff notation with a quarter-note symbol and equals sign as shown below in the traditional song Hatikvoh. Up to now, all of our other sample pieces have also been played at a tempo of 120 qpm, though this has not been indicated. In the absence of any specific markings, 120 qpm is usually a reasonable 'normal' tempo to assume. Tempo has a strong impact on the mood of music. With our tempo measurement, we can specify the prcecise speed of a piece of music so that we get exactly the feel we are looking for. Compare the sound of Hatikvoh played at a range of tempos. It varies from painfully solemn at slow tempos to slightly manic at high tempos. There are Italian terms which can be used to indicate tempo, which appear mostly in classical music. While each covers an approximate tempo range, they are mainly intended to convey a general 'feel', and are less precise than a simple tempo measurement. Tempo can change during a piece of music. Classical music routinely uses tempo changes during a piece of music to add expression and drama. Contemporary music tends to be based on a more steady meter, but it is quite common to use a gradual slowdown in the last few bars of a song (called rallentando) to produce a more satisfying ending. Less common is the opposite effect - accelerando - where the tempo gradually increases. You will sometimes hear this in dance or folk songs - such as Zorba The Greek - as they build to a climax. You may sometimes see tempo being referred to in beats per minute (or bpm). Be careful not to get this confused with quarter-notes per minute, as they are sometimes the same but sometimes not, depending on the meter. They are the same with time signatures such as 3/4 and 4/4, which have beats of a quarter-note in length. However, time signatures based on eighth-notes have a beat length only half the size, which should normally play twice as fast. This particularly causes problems if the time signature changes during a piece of music, say from 4/4 to 6/8. Which beats would a bpm figure refer to - the quarter- or eighth-notes? It can be unclear, and to avoid this ambiguity it is recommended to use quarter-notes per minute measurements. Tempos commonly range from 60 to 200 qpm, where 120 qpm tends to be the 'medium'. Using a tempo at either end of this range (or outside it) can impact on your choice of time signature. For example, notating in 4/4 at 120 qpm is equivalent to notating in 4/8 (or even 2/4) at 60 qpm. 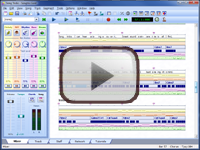 ChordWizard products such as Songtrix offer great flexibility with tempo changes. Any or every bar can have either an immediate or a gradient tempo change, and changes can be spread easily across several bars. The notation in Staff View is updated automatically.